There has been some debate to whether it is required to bring a gift to the bachelor party. While bachelor party gifts are not mandatory, it can be considered thoughtful and good manners. A lot of guests chose to bring a gift to the bachelor party that can be used during the party, such as a gag gift or novelty item. Some guests bring food, party games or even alcohol. If you know the bachelor well enough, you can think of a token gift to bring to the party. Should you bring a gift to a bachelor party? Gifts for bachelor parties are a lot like engagement gifts, acceptable but not necessary. 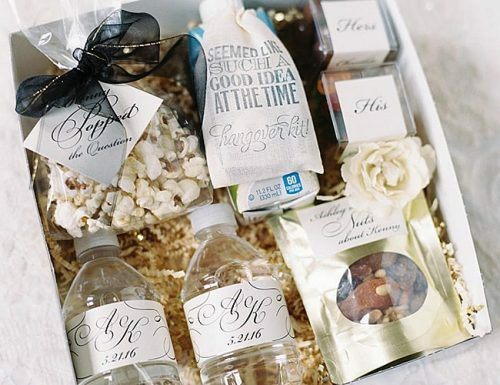 The bride and groom will be receiving gifts at the bridal shower and the wedding. So it is not tradition, nor is it required to give a gift at the bachelor party. You can decide for yourself if this is something you wish to do. Here are some ideas of popular bachelor party gifts, which will help you to buy a gift for the groom. If you are looking for funny gift ideas for the groom, you could always go with a novelty, or gag, gift. First, make sure that the groom has a great sense of humor. The last thing you want to do is insult the groom at his bachelor party. Gag Reel: You could make a funny video or slideshow of some of the grooms funniest or “most embarrassing” moments. The point is to entertain, not to humiliate. So be thoughtful and does not include anything that would embarrass the groom or make him feel uncomfortable. You could make this at home if you have the right software. Or you could have it made via an online video or photo site such as Free Prints or Shutterfly. Lovers Dice: This is a novelty item for the groom to use with his bride. Also known as “Dirty Dice,” you can purchase these at stores such as Spencers, Hot Topic or any website that sells adult toys. 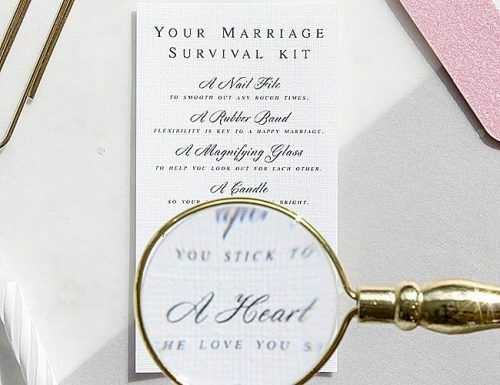 Marriage Survival Kit: This could be something that you personalize for the groom to help him “survive” married life. It could contain such items as aspirin for headaches (from the bride’s nagging), a calendar with all of their important dates such as anniversaries, birthdays, etc and small bottles of alcohol for the groom to keep hidden from his wife. Gift Card to His Favorite Pub: Purchase a gift card for the groom’s favorite pub, so he has a place to escape to when they get in a fight. Of course, you could always purchase novelty items such as shirts, hat, shot glasses and the like. If you are planning the party, you could get a group discount for the entire party or for groomsmen gifts. 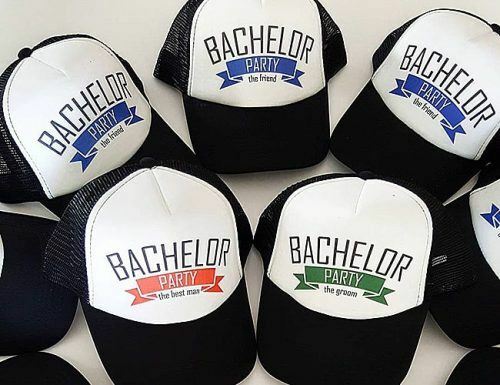 Bachelor Hats: You can easily find hats or baseball caps on sites such as Amazon, Etsy or Ebay, as well as any party supplier. You can even have them personalized. Shot Glass: Everyone loves a shot glass. Getting the groom a commemorative shot glass for his bachelor party is a unique and thoughtful gift. These can be found at stores such as Spencers or any online party supply store. Bachelor Shirts: A personalized t-shirt, sweatshirt or hoodie is a very classy gift idea. You could even purchase this along with a matching hat. Again, these could be found online or at stores such as Spencers Gifts. As well, you could have this personalized for the groom. Engraved Keychain: A personalized key chain with the groom’s name and the date of the bachelor party is a great commemorative gift. You can find these at many jewelry stores such as “Things Remembered” or other such stores. Personalized Golf Balls: If the groom is a golfer, you can have a set of engraved golf balls made, so he will always remember his bachelor party. These can be found online on sites such as Etsy. As well, you should plan some fun games for the bachelor party. Check out our site for engagement party games as well. If you decided to get a bachelor party gift at the last moment, you are not alone. There are plenty of easy and thoughtful last-minute gifts you can pick up before you head off to celebrate with the bachelor and his friends. Alcohol: No one will complain if you bring a bottle of booze to the bachelor party, especially if it is the groom’s favorite! Restaurant Gift Cards: Why not give the groom a gift card to his favorite restaurant? He can use it with friends or take the bride out for a date night. Barber Shop Gift Card: The bride is not the only one who needs to be pampered and prepped before the wedding. Purchase a gift card to the groom’s barber shop, so he can get a shave and haircut before the wedding. Photo Album or Frame: Married couples cannot have enough photo albums or picture frames to showcase their wedding or honeymoon photos. You can easily find a nice photo album or picture frame at any card shop. Visa Gift Card: No one will be insulted with a visa gift card. Weddings cost a lot for both parties so the groom will be sure to find a use, whether he uses it to treat himself to something or to buy a gift for the bride. If you wish to purchase a classy gift for the stag party, you can bring something like a bottle of champagne or a set of wine glasses. You don’t have to bring a gag gift if that is not your thing. Wine or Champagne: It is always classy to bring a bottle of wine or champagne to a stag or bachelor party. Ask around to find out the groom’s preference. 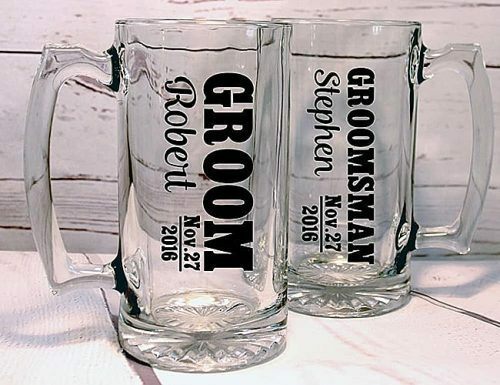 Beer Mug: An engraved beer mug is a classy gift for the groom. This can be purchased online at sites like Things Remembered or Etsy. Wine or Martini Glasses: A set of “his or hers” wine or martini glasses for the bride and groom is also a thoughtful and classy gift. Shot Glasses: Again, personalized shot glasses with the bachelor’s name and the date of the party are a fun gift for a stag party. Bonus: you can use them at the party! Personalized Flask: A flask is always a great gift, especially if the groom likes to attend sporting events! Stores such as Hot Topic or Spencers will also carry the most popular bachelorette party games. Those who are planning the bachelor party won’t want to forget the bachelor party favors. These do not have to be expensive. 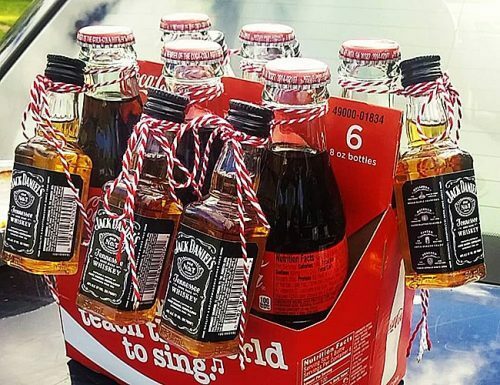 Again, novelty items such as beer mugs, key chains, and shot glasses are ideal party favors. Commemorative Beer Bottles: You can order special beer bottles with commentating labels online. Or simply print your own and stick them on the beer bottles for the bachelor party. Beer Koozies: Beer koozies are an inexpensive and fun idea for a bachelor party favor. And you can order them online any party goods supply store. Group T-Shirts: T-shirt is cheap when purchased bulk. You can order t-shirts commentating the bachelor party theme for the entire party! Hangover Kits: Hangover kits are always a good idea for the “morning after.” You can make personalized hangover kits for party favors that include items such as barf bags, aspirin, orange juice and other items needed to nurse a hangover. Travel Mugs: Travel mugs with the theme and date of the bachelor party are a great way to remember your guys night out! We hope our list of great bachelor party gifts has given you some ideas about what to bring to the bachelor party! Looking for more inspiration? Check out Wedding Forward for ideas for wedding gifts and wedding entertainment!